The contenders gave it their all during the first of a two-part finale of "Dancing with the Stars" Monday night. Leading into the show, it was still unclear if pro-dancer Mark Ballas would even compete after suffering an injury during rehearsals on Sunday. But he managed to make it to the stage, pulling off two solid dances. It was down to the wire with celebrity contenders Candace Cameron Bure, Meryl Davis, James Maslow and Amy Purdy all vying for the mirror ball trophy. 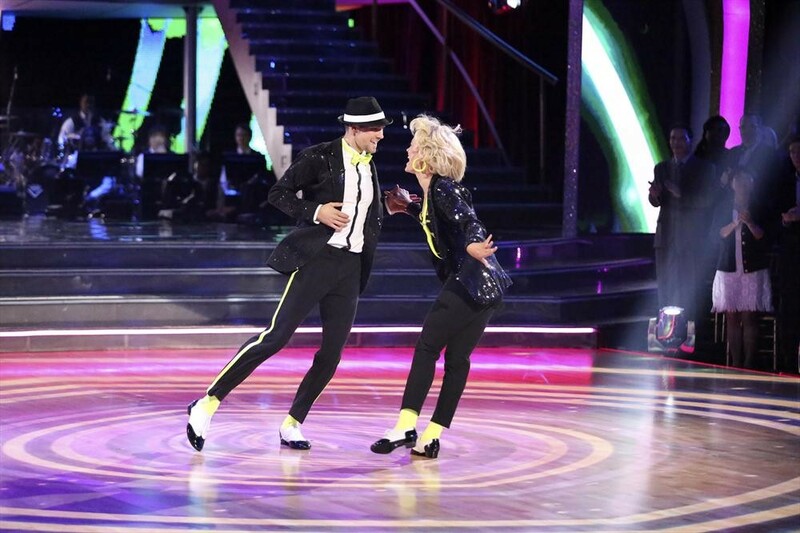 Peta Murgatroyd and Maslow heated things up with a tango, which also saw the pair sneak in a kiss on the dance floor. They received positive reviews from the judges who called it focused and passionate. Carrie Ann Inaba described the routine as a "sharp and intense," earning them a total of 29 out of 30. They received 29 points for their freestyle dance as well. Davis and Maksim Chmerkovskiy are clearly in it to win it -- particularly Chmerkovskiy, who's hoping for his first-ever "DWTS" win. "I want to look back and say I literally have nothing else, nothing left to give," he said. They earned a perfect score of 30 for their tango routine and showed off some passion for their second dance. Inaba, for one, was impressed, saying, "First of all, I think you guys should get married...This is what true dance is about." The pair almost kissed, prompting co-host Erin Andrews to say, "We all wanted you to kiss -- I'm not even kidding." That second dance also received 30 points. Purdy tried to fight through ongoing back issues, noting how she's determined to overcome "another hurdle." Purdy and her pro-partner, Derek Hough, received rave reviews for their salsa routine, with judge Bruno Tonioli saying Purdy was "on fire." Inaba added, "Every week I'm baffled by you." A perfect 30 went to the pair. For their freestyle routine, Purdy hung from a rope, which aside from Len Goodman, impressed the judges. They received 29 points. Who will win "Dancing with the Stars"? Ballas fought through his shoulder injury and took on a quickstep with former "Full House" star Cameron Bure. Inaba thought it was "well, well done." Goodman said, "You did good." They earned 27 points -- not the best score, but considering Ballas' shoulder issues, not bad. Ballas appeared to be struggling a bit through the second performance, though. Still, Tonioli called it "great fun," but they only received a total of 24 points. Despite their low scores on Monday, Ballas and Cameron Bure are heading to Tuesday's final round. In the end, Maslow and Murgatroyd got the boot. Even their sultry kiss couldn't save them. "I've really had an amazing experience on this," Maslow said. "I enjoyed it more than I ever thought was possible." Thank you to all the #TeamJeta fans who helped @PetaMurgatroyd and I get so far! It's been an amazing journey. And you were all a big part! A winner will be chosen on Tuesday when "DWTS" returns for one more round. The two-hour finale begins at 8 p.m. ET.